It seemed like the madness of the Christmas season had only just finished, when suddenly it was Valentine's Day, Mother's Day and then Easter! It has been a very busy start to 2018 here at Slattery, with brand new products being created for all occasions. One of our most exciting new products involves a collaboration with a local Manchester brewery, Joseph Holt, on a brand new chocolate stout. "Dark Delight" was launched on Thursday 15th March after a 4-6 week brewing process to ensure the smoothest flavour was created. The Dark Delight Chocolate Stout is available in many Joseph Holts pubs across Manchester, all which can be found on their website. We also created a chocolate bar using our luxury milk chocolate from Barry Callebaut and toasted chocolate barley, which is one of the flavourings within the Dark Delight stout. We had an extremely busy month in the lead up to Easter, with our staff working hard on new innovative ideas to keep our shop fresh and exciting. All our Easter products are handmade in store by our skilled chocolatiers. Our Unicorn Easter egg proved to be just as popular this year as it was in 2017, leading us to design two colours to choose from. 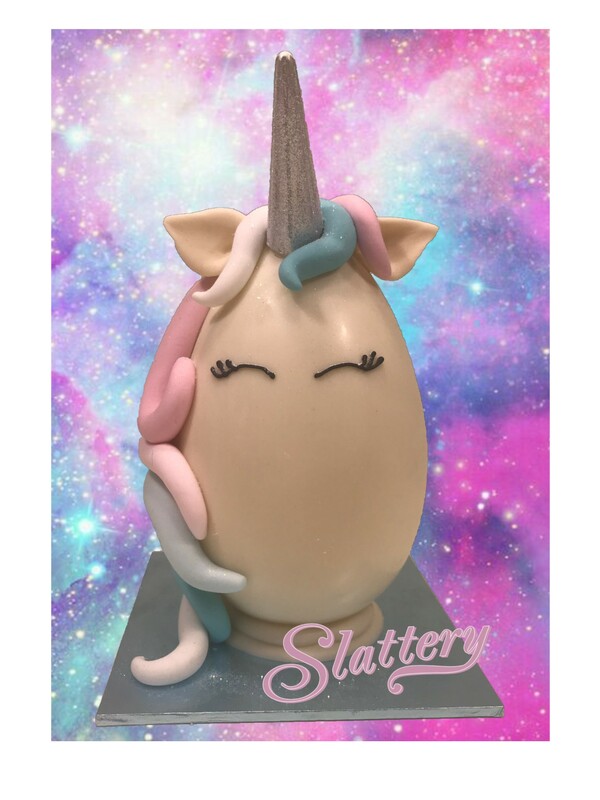 The design this year was a white chocolate egg with a choice of either a rainbow or pastel coloured mane, filled with tasty chocolate callets. Other big hits were the Spiderman and Dinosaur egg, and our fantastic new Manchester Bee Egg, infusing honeycomb and chocolate with the famous Manchester worker bee design. In the two weeks leading up to Easter weekend, we were invited to have a pop-up stall in House of Fraser in Manchester City Centre. We took along our Manchester range of chocolate products and some of our Easter novelties. It was a great opportunity for us to take our products to the city centre for those who work in central Manchester and can't always visit our Whitefield shop. With Father's Day, exam results and graduations fast approaching, the Slattery team are busy working to create the perfect chocolate gifts! As the summer months draw closer, our seasonal favourites will be back in store. Takeaway afternoon tea's, chocolate dipped strawberries and our homemade ice cream will all be available to enjoy in the sunshine… if we get any! We are also excited to launch our new menu in the Masons dining room. With lots of customer feedback we've kept some classics but are introducing some new "sure to be favourites".